The Eastern Interstate 76 forms a major east-west route across eastern Ohio and Pennsylvania. It joins the Philadelphia metropolitan area with Pittsburgh, Akron and Cleveland, Ohio (via I-80). I-76 doubles as the majority of the mainline Pennsylvania Turnpike, and it follows the extreme eastern segment of the Ohio Turnpike as well. Portions both west and east of these toll roads are free, with the exception of the tolled Walt Whitman Bridge across the Delaware River. The Schuylkill Expressway in Philadelphia carries I-76 southeast from Conshohocken into the City of Brotherly Love. The often congested route predates the Interstate system with completion in 1954. The eastern Interstate 76 combines with U.S. 224 from Interstate 71 to Akron, Ohio. The freeway shifts north of the U.S. 224 corridor east to the Ohio Turnpike near Lordstown. Angling southeast, the I-76 eventually meets U.S. 30 at Irwin, Pennsylvania. U.S. 30 parallels the PA Turnpike east to Philadelphia. U.S. 322 and U.S. 422 also mirror the course of I-76 east from Harrisburg and Hershey to the Philadelphia suburbs. The eastern end of Interstate 76 ties in with Interstate 295 and the North South Freeway (New Jersey 42) at the boroughs of Bellmawr and Mt. Ephraim. The substandard interchange at the junction uses substandard ramps for the I-295 mainline movements and involves weaving traffic patterns where I-76 and I-295 run side by side. The I-295/I-76/Route 42 Direct Connection addresses deficiencies with ramp geometry, weaving traffic and safety concerns at the interchange. With an estimated cost of $900 million, the four-contract project commenced in March 2013 on initial construction (Contract 1) along I-76 to the north and I-295 as it ties into the North South Freeway from the west. The eventual layout of the interchange joining Interstates 76 and 295 with New Jersey 42 (North South Freeway). Contract 1 work wrapped up in fall 2016. Construction on Contract 2, which replaces the ramp from I-76 east to I-295 east, started in summer 2014. Running through fall of 2017, the second phase also rebuilds the exit ramp from I-295 south to I-76 north. Beginning in winter of 2016, Contract 3 shifts the southbound mainline of I-295 away from a 35 mile per hour ramp onto a new alignment spanning Interstate 76. Contract 4 follows from 2020 to 2023 to complete the elevated roadway for I-295 and the final reconstruction of the North South Freeway. Prior to the renumbering of I-80S as I-76, Interstate 680 was the designation for the freeway south from Vine Street to the Walt Whitman Bridge. The Vine Street Expressway opened initially between the Schuylkill Expressway and 18th Street in 1959. Completion of the route was delayed until 1991. One of the first superhighways constructed prior to the Interstate Highway System, the Pennsylvania Turnpike opened initially with 160 miles between Middlesex and Irwin on October 1, 1940, only three years after the Pennsylvania Turnpike Authority was created.1 This was a full 16 years prior to the establishment of the Interstate Highway System in 1956. Between 1950 and 1956, the Pennsylvania Turnpike was extended both east and west, connecting to the Ohio Turnpike in the west and the New Jersey Turnpike in the east. But the route was not always Interstate 76. Right after the creation of the Interstate Highway System, the Interstate 80S designation was applied to the majority of the turnpike in 1958, and it remained as the numerical designation until 19642, when I-80S was dropped in favor of newly designated Interstate 76 from Monroeville east to Gloucester City, New Jersey. Until 1964, eastern Pennsylvania loops and spurs from I-80S were given the designations of Interstates 180, 280, 480 and 680. 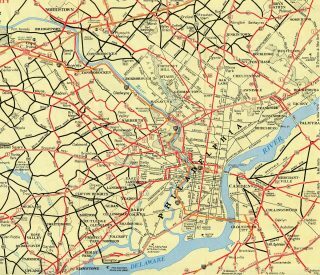 These later became today’s I-176, I-276, I-476 and I-676 when I-76 was extended eastward along the PA Turnpike to Interstate 276 (Exit 326), and along the Schuylkill Expressway (former Pennsylvania 43), from I-276 southeast to the Vine Street Expressway in center city Philadelphia. Additional changes to the Pennsylvania Turnpike and I-76 came on December 3, 1971, when the remainder of I-80S was redesignated as I-76 west from Monroeville to I-71 near Seville, Ohio as approved by AASHTO. The same AASHTO meeting renumbered what was Interstate 76 along Penn-Lincoln Parkway East through Pittsburgh as Interstate 376, and former I-76 along Penn-Lincoln Parkway West as Interstate 279. These changes also resulted the renumbering of I-876 in Downtown Pittsburgh as I-579. Interstate 76 remained in this configuration for one year, when AASHTO approved a designation swap of I-76 and I-676 in Philadelphia on June 20, 1972. This decision redirected I-76 across the Walt Whitman Bridge into New Jersey while redesignating the short stretch of the Vine Street Expressway completed at that time as new I-676. Further expansion along the Pennsylvania Turnpike took place starting with construction in 1999 along the cosigned portion with Interstate 70 between New Stanton and Breezewood. Interstate 76 (North South Freeway) east reaches Exit 1C for U.S. 130 south to the boroughs of Brooklawn and Westville. Exit 1B follows for Interstate 295 north to Cherry Hill, Moorestown and Trenton. Photo taken 12/18/16. Construction through fall 2017 replaces the ramp (Exit 1B) for I-295 north with a new flyover. Interstate 295 connects with New Jersey 168 (Black Horse Pike) in east Bellmawr nearby. There is no direct access between the North South Freeway and New Jersey Turnpike, with a Breezewood connection instead made via NJ 168. Photo taken 12/18/16. Interstate 295 parallels the New Jersey Turnpike closely from Bellmawr northward to Bordentown. Contract 2 rebuilds the freeway east from I-76 to NJ 168 (Black Horse Pike). Photo taken 12/18/16. The southbound mainline of I-295 makes a sweeping curve to run along the west side of Interstate 76 below the Browning Road overpass. Presently Exit 1A takes motorists from I-76 east to I-295 south via a left-hand ramp. Contract 3 construction will remove this ramp and replace it with a right-hand ramp as I-295 is relocated onto an elevated roadway spanning the North South Freeway. Photo taken 12/18/16. Exit 1A departs from Interstate 76 east for I-295 south to Woodbury, Paulsboro and Penns Grove. I-76 ends just ahead as the North South Freeway becomes New Jersey 42 south. Photo taken 12/18/16. The adjacent roadway for Interstate 295 south sees a slip ramp for New Jersey 42 south. The North South Freeway transitions into the tolled Atlantic City Expressway in 7.7 miles. Photo taken 12/18/16. Replaced guide sign for the two-lane ramp (Exit 1B) to Interstate 295 north. A new flyover was built for this movement as part of the I-295/I-76/Route 42 Direct Connection, Contract 2. Photo taken 08/09/04. Interstate 76 east at the northbound ramp for I-295 prior to the multi-year rebuild of their interchange. Photo taken 08/09/04. New Jersey 42 (North South Freeway) crosses over both Big Timber Creek and the New Jersey Turnpike mainline on the one mile approach to Interstates 76 and 295. Photo taken 12/18/16. A right in right out exit connects the North South Freeway with Bellmawr in the vicinity of CR 753 (Creek Road). Exit 1B follows for Interstate 295 north to Haddon Heights, Barrington and Cherry Hill. Photo taken 12/18/16. Pull through panels indicate the pending transition of New Jersey 42 north into Interstate 76 west. Forthcoming Exit 1B was added during Contract 1 work between 2013 and 2016. The ramp circumvents the I-295 northbound overpass to join the freeway on the right-hand side, eliminating a weaving traffic pattern from the original Local / Express setup of I-76. Photo taken 12/18/16. The Creek Road (CR 753) overpass was replaced to accommodate the expanded northbound lanes of New Jersey 42 for Exit 1B. 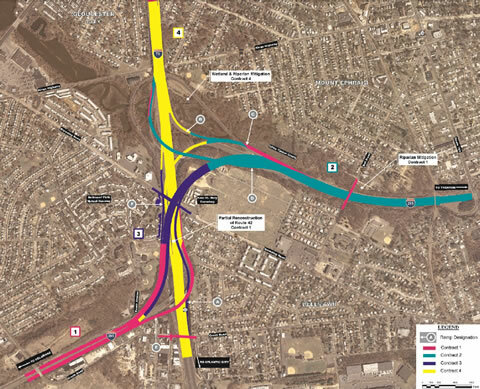 Contract 3 work will further extend Exit 1B onto a flyover to the new elevated lanes of Interstate 295. Photo taken 12/18/16. The overpass currently carrying the northbound mainline of I-295 will be repurposed into a ramp for I-76 west from I-295 north during Contract 3 and 4 work. The final phases of construction will fully separate the two Interstates and eliminate the remaining I-76 Local / Express configuration. Photo taken 12/18/16. A begin shield for Interstate 76 was erected by December 2016 at the gore point where Interstate 295 appears along side the North South Freeway. The old Local lanes of I-76 are separated by a concrete curb. Photo taken 12/18/16. Interstates 76 west and 295 north run side by side, but no longer overlap. A slip ramp provides access to I-76 west to I-676 and Camden and the Walt Whitman Bridge into Philadelphia. The remaining lanes carry I-295 east en route to Trenton. Photo taken 12/18/16. The first of two diagrammatic overheads outlined the former Express / Local roadway separation for Interstate 76 west. This sign bridge preceded the New Jersey Turnpike underpass. Photo taken 10/13/01. Passing under the original Creek Road overpass, New Jersey 42 (North South Freeway) transitioned into Interstate 76 as the Local / Express Lanes split. The Local lanes briefly merged with I-295 north, while the Express lanes represented the I-76 mainline. Photo taken 10/13/01. A sharp ramp carried the northbound mainline of I-295 across the North South Freeway. The adjacent Local Lanes merged directly with Interstate 295, resulting in a short overlap and weaving traffic pattern. Photo taken 10/13/01. Button copy overheads posted at the I-295 northbound overpass. The older configuration saw just a single lane for the I-76 Local Lanes. 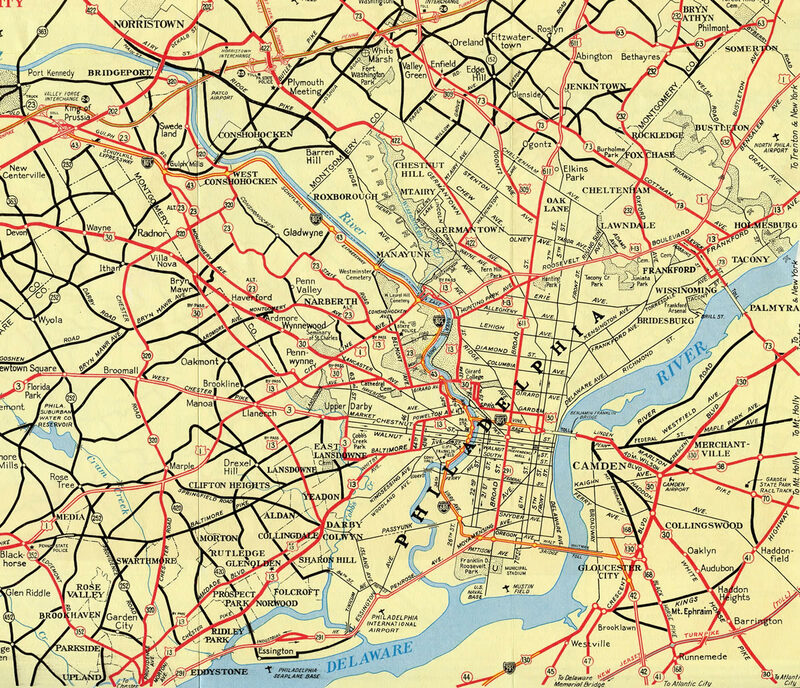 The dual freeway configuration previously extended all the way to Interstate 676 (Exit 2). They were later shortened to merge just ahead of Exit 2. Vidcap taken 12/30/95. The two Local Lanes of Interstate 76 west quickly merged with Interstate 295. The Express Lanes provided a bypass of the I-295 movements. Photo taken 10/13/01. A narrow concrete curb separated the Express and Local Lanes as Interstate 76 advanced north to the split with I-676 and tolled Walt Whitman Bridge. I-295 overlapped with the Local Lanes for approximately a half mile before departing via Exit 1B. Photo taken 10/13/01. Interstate 295 travels west from New Jersey 168 (Black Horse Pike) to a left-hand ramp (Exit 26) for Interstate 76 west. This will change during Contract 3, when I-295 is realigned to the south. Photo taken 12/18/16. This set of bridge mounted signs were replaced with a new sign bridge further west. The Local / Express setup for I-76 was removed with Contract 1 road work to rebuild I-295. The left-hand ramp (Exit 26) remains in place until Contracts 3 and 4 are completed. Photo taken 10/13/01. Speed limits reduced to 35 miles per hour along the original ramp brining Interstate 295 north onto the Local Lanes of I-76 west. The ramp was replaced during Contract 1 work during 2013-16. Photo taken 10/13/01. A new elevated stretch of Interstate 295 replaced this narrow section of freeway leading into the interchange with I-76. Exit 26 still merges onto the left-hand side of I-76 west, but will change with Contracts 3 and 4. Photo taken 10/13/01. Ohio 3 (Wooster Pike) crosses over Interstate 76, one mile east of Exit 1B for Interstate 71 north. I-71 travels 37.3 miles northeast to end at Interstate 90 in Cleveland. Photo taken 10/01/10. Interstate 76 kinks southward to cross over Ryan Road just ahead of Exit 1B. The new ramp for Interstate 71 northbound opened in 2008 as part of the overall interchange reconstruction.5Photo taken 10/01/10. Interstate 76 & U.S. 224 advance west another 0.75 miles from Exit 1B as I-71 angles southwest across the freeway between Westfield Center and Seville. Photo taken 10/01/10. An end sign for Interstate 76 west appears as Exit 1A veers away for Interstate 71 south to Columbus and Cincinnati. U.S. 224 extends west as an at-grade expressway to Lodi. Photo taken 10/01/10. Prior to 2006-10 reconstruction, motorists along Interstate 76 west entered a trumpet interchange (Exit 1) with an access road to I-71, one mile west of the Ryan Road underpass. Photo taken 05/21/02. Interstate 76 passed under the I-71 mainline between Chippewa Creek and former Exit 1. Drivers bound for Cleveland and Columbus previously departed in unison to weave with traffic from U.S. 224 east before separating at the adjacent trumpet interchange with I-71. Photo taken 05/21/02. The off-ramp (Exit 1) for Interstate 71 along I-76 west was removed following the Memorial Day Weekend of 2009 opening of a new high speed ramp to I-71 south.4 Photo taken 05/21/02. Leading away from County Road 19 (Lake Road), U.S. 224 east expands to three lanes to the trumpet interchange with the access road leading to I-71. Photo taken 10/01/10. Interstate 76 east begins as traffic for Interstate 71 departs. This ramp is classified as Exit 1 in the westbound direction but is unnumbered eastbound. The capital city of Columbus is 90 miles to the southwest. Photo taken 10/01/10. An overpass carries motorists from I-76 west to I-71 south as traffic from U.S. 224 east for I-71 departs below. Interstate 76 overlaps with U.S. 224 east 18 miles to I-277 in Akron. Photo taken 10/01/10. Straddling the north side of the Westfield Center village limits, U.S. 224 makes its way to Interstate 71 and the eastbound beginning of Interstate 76. This button copy sign for I-71 and I-77 was replaced after 2008. Photo taken 05/21/02. The U.S. 224 expressway lowers around 150 feet in elevation as it bypasses Westfield Center to County Road 19 (Lake Road) and Interstate 76. Photo taken 05/21/02. Button copy sign posted after the traffic light with County Road 19 on U.S. 224 east. The original interchange configuration with I-71 was reminiscent of a toll highway connection. Photo taken 05/21/02. Interstate 76 & U.S. 224 east at the off-ramp for the I-71 access road. The trumpet to trumpet interchange here dated back to at least 1961. It connected then with a short expressway segment of U.S. 224 east to Ohio 3. Photo taken Chris Curley (12/29/00). A ten-year project to expand Interstate 71 from Cuyahoga County to Morrow County wrapped up with a ribbon cutting ceremony held on August 4, 2010. The project concluded at I-76 & U.S. 224, with the widening of 3.2 miles of road, six ramp realignments and the addition of three new ramps.6 Photo taken 10/01/10. Exits 209A/B departs one half mile south of the I-76 & U.S. 224 underpass along Interstate 71 south. The forthcoming exit was separated so that traffic bound for Akron merges onto Interstate 76 directly. Photo taken 10/01/10. Exits 209A/B for I-76 east and U.S. 224 is the lone departure point for Interstate 71 south over the 15 mile drive from Medina to Burbank. Photo taken 10/01/10. Exit 209 partitions for Interstate 76 & U.S. 224 east to Wadsworth, Akron, Youngstown, and Pittsburgh and U.S. 224 west to Lodi and Findlay. Photo taken 10/01/10. Replaced button copy sign posted two miles north of Interstate 76 on I-71 south in Guilford Township. Photo taken by Steve Hanudel (05/21/05). Prior to the addition of the direct ramp for I-76 & U.S. 224 east, all traffic departed via a single ramp (Exit 209) from I-71 south to combine with the off-ramp from I-71 north. Photo taken by Steve Hanudel (05/21/05). “Pennsylvania Turnpike through the Years,” Allentown/Lehigh Valley Morning Call, 4/18/04 and 04/19/04. “I-71 Ramp to Close.” Akron Beacon Journal (OH), October 21, 2008. “I-76/71 Ramp Nearly Done – ODOT Sets $37 Million in Projects for Wayne, Medina Roads, Bridges.” Akron Beacon Journal (OH), April 9, 2009. “ODOT Digs into Work at Medina Interchange – 3 New Ramps Expected to East I-71, I-76 Traffic” Akron Beacon Journal (OH), April 11, 2007. “Officials Celebrate Widening of I-71 – Final Leg of Interstate Project Costs $77.3 Million.” Akron Beacon Journal (OH), August 5, 2010. Page updated January 6, 2017.